New Delhi: July 29, 2016: ZyXEL Communications Corp. is a world-class networking company providing innovative and dependable Internet solutions, strengthening its product portfolio with end to end GPON solution, which provides high-speed fibre access network for FTTH, FTTB, FTTC applications. The portfolio include OLT2406 (16 port temperature hardened GPON chassis) & PMG5318-B20B (GPON residential gateway with 4x GbE LAN port, 2x FXS, 2x USB ports & IEEE 802.11N 300Mbps Wi-Fi). The ZyXEL OLT2406 Series provides up to 1024 FTTH subscribers with four PON line cards that supports four ITU-T G.984 GPON fibre links or four GbE line cards for 16 active non-blocking Gigabit Ethernet fibre links. The GPON line card supports the split ratio up to 1:64, while each of the four SFP slots supports both class C+ and class B+ transceivers for different service reaches. The temperature-hardened exclusive design allows service providers to install OLT2406 Series in street cabinets to provide services for more subscribers. The OLT2406 Series supports Dual Stack. By supporting MLD, IGMP as well as other comprehensive IPTV functions, the OLT2406 Series can be deployed in either IPv4 or IPv6 environments. Users can also have provision protocol-based VLAN for IPv6 traffic or assign various IPv6 access control list profiles for each subscriber. The OLT2406 Series provides two types of PON protection defined in ITU-T G.984, type A and type B, to prevent fibre cuts or PON card failures. With all common modules supporting redundancy, the OLT2406 Series is able to avoid single-point failures to ensure non-stop user traffics, and service providers can benefit from applying VLAN bridging, VLAN translation, VLAN isolation and Multicast VLAN to quickly setup services for various types of subscribers. The OLT2406 Series also supports comprehensive QoS and complete traffic management for efficient triple-play services. 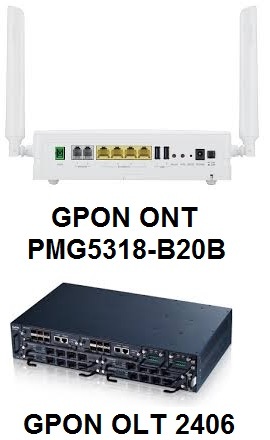 The ZyXEL PMG5318-B20B can be connected to a GPON OLT to provide network operators with management and provision functions that support ONT Management and Control Interface (OMCI) as well as TR-069 management functions. As a result, the operation and maintenance of the PMG5318-B20B are extremely easy and efficient. As higher bandwidth and greater efficiency of Ethernet cannot ensure effective delivery of high-quality voice, data and video across a GPON network, service providers can freely design their Quality of Service (QoS) policies and prioritize mission-critical services such as IPTV and VoIP based on their service plan offerings. This increases network efficiency and productivity to enable service providers to offer a real multi-play solution that meets the needs of residential users. The ZyXEL PMG5318-B20B features 802.11n technology to provide an ultimate solution for both speed and coverage. With 802.11n, wireless data rates of up to 300 Mbps, the PMG5318-B20B provides stable, reliable wireless connections for high-speed data and multimedia applications. The 802.11n technology empowers the device to eliminate dead zones and to extend coverage while retaining backward compatibility with any IEEE 802.11 b/g/n Wi-Fi certified device.